Perhaps because of the Sherlockian undertones so prevalent in the character and very fabric of Doctor Who, the franchise has always seemed perfectly at home within the confines of a stylized Victorian era. 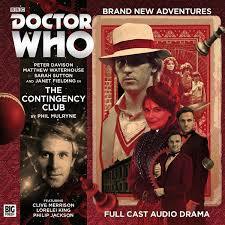 With ‘The Contingency Club,’ Big Finish returns the Fifth Doctor to that atmospheric period just as The Contingency is quickly becoming the most exclusive and desirable gentlemen’s club in London. Yet as the peculiarly oblivious members, uncannily identical servants, and frightfully dangerous goings-on within the cellar and upper floor suggest, however, a much bigger game than simply achieving social status is being played within the club’s walls. ‘The Contingency Club’ wastes no time in getting the leads involved in the mysterious events after the TARDIS loses power and literally falls out the vortex. Coming upon a valet named Edward, the four travelers are quickly welcomed to the club, its members within showing no real individuality and not taking any notice of their strange attire nor of the fact that Nyssa and Tegan are, in fact, women. Their good fortune does not last long, however, as they quickly become divided and slowly begin to learn the dangerous truth about the club’s mysterious owner, Mr Peabody, and his secretive benefactor, the Red Queen. Any story set in Victorian times will inevitably draw comparisons with ‘The Talons of Weng-Chiang,’ and the search for missing people and the presence of a stage mesmerist as a primary antagonist add a bit more weight to that comparison in this case. However, ‘The Contingency Club’ quickly forges its own path as an obsession with games and bets quietly unfolds on a cosmic scale, threatening the known history of Earth in the process. The Red Queen, accordingly, bears at least a superficial similarity to a beloved classic foe, but her family’s dangerous motivations and strict adherence to rules lend a slightly different but utterly believable type of sinister air to her. Lorelei King does exceedingly well in bringing out a threatening yet nonchalant air about the character, and this race could certainly make for a fascinating recurring foe in future stories based on the initial information and characterization offered here. While all of the performances are exceptionally strong, ‘The Contingency Club’ is fortunately not a story that simply presents a situation for the Doctor and his companions to put right with little explanation for how that situation came to be. Instead, writer Phil Mulryne slowly builds up the world both within and outside the confines of the club, and the explanations offered for why only certain people are afforded membership while others are declined for the most frivolous of reasons suits the story quite well. Society writer George Augustus and his desperate quest to become a member alongside Marjorie Stonegood and her search for her father who helped to design the London Underground but has not been seen since being contacted by The Contingency add a very human element to the script that helps to ground the otherwise fantastic events. ‘The Contingency Club’ successfully experiments with the norms of gothic mysteries and of the story types in which this 1980s cast is usually featured. Peter Davison’s Fifth Doctor is once more exceedingly comfortable in Earth’s past, his everyman mentality allowing him to blend in unassumingly as he strives to discover the truth. Davison himself gives an energetic performance full of indignation and humour as his character once more also tries to look after the safety of his rather expanded roster of companions, the dynamic of which both the writing and acting capture perfectly even if the companions’ roles are ultimately somewhat limited in scope due to their numbers. While there are several moments of familiarity as the tale progresses, there is certainly enough unique about this script to entertain from beginning to end.